The basic meaning of the term ‘alpha boss’ refers to a person in the work place who shows or behaves in an intolerant way if any task or challenge comes in their way, thus showing a level of power as well as dominance in the workplace. This is a situation which every person can encounter in the workplace from time to time and if they do not deal with it and continue with it then a number of problems may arise in the workplace and thus causing an imbalance in the organization. So it needs to be handled as soon as possible and there are ways towards solving such a problem arising in the workplace which has been mentioned below. One of the most important things that a person needs to remember at the start when they confront an alpha boss is that they need to build a trust in the eyes of the boss and respect the boss so that at the earliest they can get to know the person at the initial stages itself. And also not face any problems for the current time and can work together in harmony in the organization. It is necessary that the person when working in the office and carrying out the work in front of the boss shows that they are important in the workplace in completing the tasks. The person needs to show the boss that they are willing to work together with the team rather than working alone. With this the alpha boss will realize that the individual wants to really establish himself in the workplace as an important member of the workplace. Whenever it comes towards gaining the trust of the boss and changing the negative behaviour within, then they need to remember that this process is very long and they need to stay patient at all times as many setbacks and difficulties will come in their way. Having patience within is the best way towards finding a solution towards changing the behaviour of the boss which will happen at the right time. It is important for the person to know that their boss has all kinds of strengths within them and which are sometimes not realized by them when they show their negative dominating qualities. There are a number of qualities that a boss may have within them which can improve their everyday quality of the work they do and can even help in improving their behaviour. Once the person has gained the trust of the boss and has understood all the qualities they possess within then they need to remind their boss from time to time the qualities they have such as their greatest strengths they possess which can lead to them thinking on their overall behaviour in the workplace and can help them focus much more positively in the workplace rather than behaving in a negative way. Even though whatever the situation may be in the workplace, the employee shouldn’t criticize the boss at any time whether it is in person or in public. As this situation may erupt fast and the boss will retaliate in a very bad way insulting the employee and it is much worse if there hasn’t been any trust factor built yet with the boss. A time will come in the workplace when a certain challenging task or situation may arise in the workplace. So before talking about it to the boss, the person needs to ensure that they have a solution already ready with them before presenting it to the boss. This will show the boss that the person or employee is willing to work together with the team and wants to keep improving the way the workplace functions which can even bring out a positive side of the boss. When a person comes across an alpha boss they should realize that those people aren’t that emotional in comparison to others and they may not consider the present state of the person at times and will insult them or behave in a negative way. So the person or employee should not take any of the actions of the boss personally and let it harm their life as it is necessary that the person acts wisely when this happens and doesn’t let it trouble their life. It is important for the employee at the initial point to build up a strong relationship between the boss and themselves. Though at first they may have to do tasks or follow orders which aren’t really comfortable with but at least in this process the person can build in a strong relationship with their boss so that it can benefit them in the future and have less of a problem later on. When the employee has completely gained the trust of their boss and has built a strong relation with them, then during any kind of discussion or carrying out any kind of task they can provide any kind of necessary feedback which can refer to the matter that is being discussed at that time. This kind of feedback can be straight forward in nature but not being rude or harsh at the same time which can lead towards changing the negative behaviour that the person possesses. This comes in the advance stage of the job. When everything with the employee and the boss is working very well in harmony but still the boss has a dysfunctional behaviour in the workplace, the employee can look forward towards bringing a change in the attitude of the boss so that they can recognize where they are going on in carrying out their everyday work and can help in brining out a drastic change in the behaviour of the boss for a long term. It is always advisable irrespective to whatever the relationship may be between the employee and the boss, that the person should rehearse to themselves or with a coach before speaking to the boss what they wish to speak or convey to the boss. This helps them realize whether they are mentioning something wrong and always speak the on going facts in the workplace to be made aware to the boss. It is well known at the moment that though the alpha boss wants the employees to simply follow certain instructions given, they are mainly open to ideas from the others even if it is isn’t in their favour. But all these ideas or any kind of talks to the boss needs to be done and presented in the appropriate way so that there aren’t any misunderstandings between the boss and the employee and the boss may not feel that the employee is trying to overpower his decisions. When the person starts to understand the behaviour of their boss and knowing the way they are, they need to try as fast as they can to gain some confidence of themselves in the eyes of their boss. When the person earns the boss’s trust he automatically becomes confident in confronting the boss regarding the behaviour in the workplace and on seeing this boss also understands that the person or employee is trying to bring in some change within the boss. 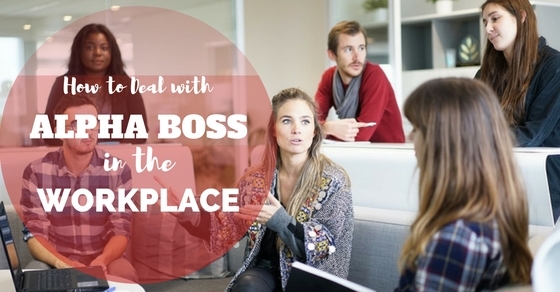 When any kind of conversation is being going on between an employee and the alpha boss, the employee should never be afraid to convey any kind of message to the boss or share any opinion to them. If the person tends to show the feeling of fright to the boss, the person may understand that there can be no change expected for the future also within the boss as they may continue to act in the same way yet again and show their dominance in the workplace. When an employee encounters an alpha boss, they need to start building a support network with people who are at the same level or are at a higher level in comparison which will help them in building contacts with them. But this process should be done in a very cautious way so that the boss isn’t threatened by the way the employee is acting and the boss shouldn’t be aware regarding any of the other contacts that the person is building with others. Even though boss has supreme power in their workplace, but without any support from their employees the power and leadership they posses is nothing. So it is important that when a person looks to dealing with an alpha boss that no matter if they have build some contacts with other people, they must always support the boss’s decision and if they have gained the boss’s trust then they can let the boss know where things are going wrong while discussing. In reference to how the boss behaves with employees it is recommended that there should always be a boundary between the boss and the employee. This helps the employee a lot especially when they are expressing themselves or any kind of opinion in front of their boss, so that everything stays under limit and nothing what isn’t meant to be spoken, is said out. If the person really wants to challenge the boss’s authority in the office then they should really see whether both of them have really got that level of trust within them and how close their relationship is at the moment. But if unknowingly they take such a step then the further consequences will be severe and the boss may retaliate in an unexpected way which can really be defensive and insulting towards the employee. Once the employee starts letting the boss realize what is being done wrong on the part of the boss with respect to the behaviour and functioning in the workplace, the boss must slowly realizes that they also must try to understand that they too need a personal change within so that they can improve relations with their other employees. It will help in building their reputation and also improving their performance level. So when a person in the workplace looks forward towards dealing with an alpha boss it is expected that influencing the alpha boss to change their behaviour will take a lot of time and it isn’t an easy process. But if the person uses the right ways in dealing any on going situation then the relationship between the employee and the boss can be improved in the way where it isn’t so formal in nature and the boss can change the negative attitude in him.